DanceBlue is a University of Kentucky student-run organization that fundraises year-round and culminates in a 24-hour no sitting, no sleeping dance marathon. The money raised through DanceBlue is donated to the Golden Matrix Fund, established to support the kids of the DanceBlue Kentucky Children’s Hospital Hematology/Oncology Clinic both today and well into the future through an endowment. DanceBlue also helps to provide funds to support research at the UK Markey Cancer Center. The Golden Matrix Fund was created to benefit the DanceBlue KCH Hematology/Oncology Clinic patients and families. Childhood cancer not only affects the child physically, but it also creates many emotional and financial difficulties for the entire family. The goal of the Golden Matrix Fund is to provide care and support for the kids through giving them and their parent’s comfort. Through 13 years of DanceBlue, more than $13 million has been raised to support this cause. In addition to small but important patient support programs such as the “Beads of Courage” program that each child receives after cancer treatments, this fund has been able to allow the hiring of vital staff in the clinic such as a Childlife Specialist who provides encouragement and distraction to help the child emotionally handle their diagnosis and the treatments. Additionally, a school intervention specialist has been brought on as an advocate for the patients within schools to ensure they do not fall behind in classes as a result of their treatment. Finally, the support of the Golden Matrix Fund has recently allowed for the construction of a new Pediatric Hematology/Oncology Clinic that has expanded the capacity of the clinic as well as providing a more convenient and comfortable experience for the families. Thank you for all of your support and hard work in helping us provide care for our pediatric cancer patients and their families here at the University of Kentucky. Few things are more frightening and life-changing than having a child diagnosed with cancer. Your efforts in raising money and volunteering in the clinic are showing these children and families that there is a community that cares for them, and your hard work is truly making a difference in their lives. Jarrett Mynear was born on April 16, 1989. He was smart, quick-witted, energetic and enthusiastic. Jarrett made friends whenever and wherever he went. He became a renowned humanitarian, a successful public speaker, and a local celebrity. He made appearances on the Rosie O’Donnell show, walked President Clinton’s dog, started his own philanthropic organization named Jarrett’s Joy Cart, and witnessed the creation of his biography, “The Joy Cart” by Marvin Bartlett. Jarrett was diagnosed with Ewing’s Sarcoma, a rare bone cancer, at the age of two. His leg was amputated at age three, and he was diagnosed with various forms of cancer six times by age thirteen. However, what made Jarrett special was his undying spirit, his ability to cope with life-threatening situations, and his devotion to helping others. During the last week of his life in 2002, Jarrett created a list of requests. One of which was to raise funds for improving the Pediatric Oncology Outpatient Clinic at Kentucky Children’s Hospital. The first of these fundraising efforts was the Jarrett Mynear Fund (JMF). The JMF started collecting donations for the renovation of the Pediatric Oncology Clinic at Kentucky Children’s Hospital and eventually raised $448,000. The driving forces behind the JMF, Jennifer Mynear (Jarrett’s mother) and Susannah Denomme from the University of Kentucky Office of Development, brainstormed ways for the University of Kentucky student body to participate in supporting the pediatric hematology/oncology clinic. Susannah’s daughter, Carolyn, introduced them to Penn State University’s THON, the largest student-run philanthropy in the nation which benefits the Pediatric Oncology Program at Hershey Medical Center. Jennifer and Susannah believed that a dance marathon would be an ideal fit and would become one of the greatest traditions at the University of Kentucky. 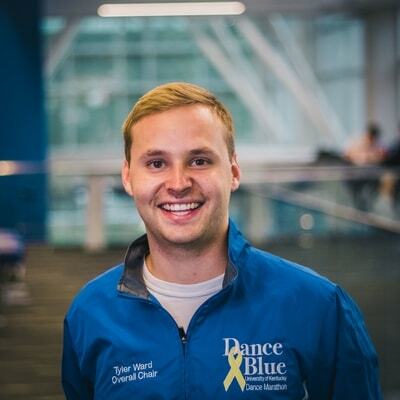 After finding support from the Office of Student Involvement and presenting the idea to several campus organizations, the dream of DanceBlue came to fruition. In its first year, DanceBlue was able to raise $123,323.16 for the Golden Matrix Fund and the Markey Cancer Center, breaking all fundraising records for a first-year dance marathon event. DanceBlue has become one of the fastest growing dance marathons in the United States. In 2018, DanceBlue raised a record $1,804,068.77 For The Kids, and we hope to make 2019 the best year For The Kids yet!